My attention was caught by the blurb when browsing NetGalley, as I recalled I'd read the first book in this interesting series and thoroughly enjoyed it. Leandra Weal has a bad habit of getting herself in dangerous situations. While hunting neodemons in her role as Warden of Ixos, Leandra obtains a prophetic spell that provides a glimpse one day into her future. She discovers that she is doomed to murder someone she loves, soon, but not who. That's a pretty big problem for a woman who has a shark god for a lover, a hostile empress for an aunt, a rogue misspelling wizard for a father, and a mother who--especially when arguing with her daughter--can be a real dragon. Leandra's quest to unravel the mystery of the murder-she-will-commit becomes more urgent when her chronic disease flares up and the Ixonian Archipelago is plagued by natural disasters, demon worshiping cults, and fierce political infighting. Everywhere she turns, Leandra finds herself amid intrigue and conflict. It seems her bad habit for getting into dangerous situations is turning into a full blown addiction. As chaos spreads across Ixos, Leandra and her troubled family must race to uncover the shocking truth about a prophesied demonic invasion, human language, and their own identities--if they don't kill each other first. I really enjoyed the start of this series, which charts the progress of Nicodemus Weal, a highly gifted but dyslexic spellwright, who alters crafted spells as he misspells them. The magic system in this world is highly complex and has far-reaching consequences. I love the fact that Charlton doesn't just highlight some angst-ridden, highly gifted individual who is cursed with major abilities that stops her being a normal somebody doing normal things -- he also investigates the effect on her equally angst-ridden, highly gifted parents, too... In short, this is a detailed look at a family dynamic complicated by a whole mess of magical ability which overlays the usual inter-generational resentments and marital tiffs. The result is a mixture of full-blown adventure and major action interspersed with amusing and/or poignant interludes as the Weal family struggle to interact without killing each other. Leandra's relationship with her draconic mother is particularly fraught. There is also a raft of other characters who leap off the page with their sheer imaginative complexity -- I particularly enjoyed the four-armed neodemon with three aspects, as well as the shark god. Charlton's scene setting also is worth a mention -- Spellwright is suffused by the atmosphere of the huge, stone buildings that were built by an ancient race and Spellbreaker is similarly influenced by the island archipelago of Ixos ruled by Leandra. However, what makes this book stand out for me, is the way the magic is defined and limited by the process and the spellcaster's particular abilities. It is often mentioned or alluded to, but it is only the likes of Jim Butcher in his Harry Dresden series and Benedict Jacka in the Alex Verus books who demonstrate this kind of rigor. Charlton takes that to a new level in what I can only characterize as hard fantasy. This was an engrossing and interesting read that brings this intriguing series to a triumphant close and comes very highly recommended. 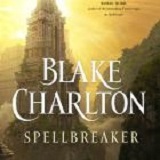 I received an arc of Spellbreaker from the publisher via NetGalley in return for an honest review.